i am trying to add a bit of kick and sound to my 2014 OS i have the es cvt version and comes with a very crappy sound for those planing on upgrading their head unit hear out some of my tips. first of all do not ever unplug the battery from car. i know everywhere you go the first step is to unplug the battery to work on the car safely but with this car if you remove the battery the auto windows will not work now for some you may think that this is nothing but to fix this issue you will need to take it to the dealership to reprogram them. another tip is do not at any point turn the car on wile any of the cables are unplugged i did this mistake wile testing the speakers the car gave air bag service error codes now even if you resolved the issue the code stay and that's another trip to the dealer to clear the code now my car is in warranty i played dome and they cleared it at no charge. what i found. the front console is very easy to take apart for those who want to remove it with out braking any plastics all you will need is a flat head screw driver. from the bottom of the radio above the air controls there will be to very thin gaps that can be used to pry open the console bit by bit to not brake or cause scratches. then here are the connectors for the radio. here are the side moldings where the tweeters are supposed to be. i tested the cable is atleast pluged to the sterio. im going to upgrade the two front speakers to component speakers and ill be retro fitting decent tweeters in the two rear speakers will be 3 way co speakers. i did not take pictures off the stock speakers it was to dark at night i almost threw them in the trash and if your planing on upgrading yo may do the same just picture a paper disposable plate with a tiny 2 inch magnet with no metal all plastic its about 30 w and 4 ohms. will post pictures when i upgrade those. now i have the 2014 new radio i am not a fan of the 7 inch display and rather keep my factory look and sounds i get when my door is opened pluss my warranty will not cover electrical if i upgrade. maybe in a few years . to run the power cable i will be drilling a hole next to the hose for the rear winshield wiper its at the bottom of glove copartment you will need to remove the cover its being hold up by two plastic clips. it will be the only black rubber hose passing the fire wall if you have a 6g or smaller cable to run you may be able to fit it next to the hose im going to use a 4g wire so i must drill but theres plenty of clearance. this will be my end resolt of the set up not i have a 2000w amp lanzar that if i may say works realy nice for my old car never overheated never gave me any issue or distortion now keep in mind my set up is on a buget and i am not looking to blow the streets but if i may say if i push this up to its max is good to impress. i like the fact i still have space in my trunk i just need a place to hide my amp if you guys have any ideas let me know it does not fit under the seats and i plan on keeping my spare tire. my only idea is to get a trunk cover the one that sits ontop and just screwing the amp there. let me know what you guys think and if any question about the install let me know. I also lost the auto power windows but found a way to program it back myself. It's really simple, you just have to manipulate the switch a certain way. I learned it somewhere online and did it while driving so it can't be that hard. ^--- tell them you took it to an aftermarket car audio installation place and they said you had to take it to the dealer to get the code cleared. On a side note, you installed an aftermarket head unit I take it? What installation kit did you use if any? jnoel0384 I'll check at work on Tuesday If I have one I will post a picture of the wiring diagram . I will also check with my friends at the local stereo shop . They will give me links to a website that will have it . T15OutlandersportSport that would be great!!! I have searched all over the Internet to find a lot of useless info. I didn't think about it being hard to find wiring diagrams on a brand new car. jnoel0384. I installed a few weeks ago an Alpine enclosed powered sub. It sounds great. I kept the factory head untit without NAV system and hooked it up to the front passenger speaker wires and put it under the passenger seat. Did not use RCA. If you want I can send you a pic of the speaker wires and explain what I did. Ok. My sub can be connected to either hi or low output. Anyways. This is what I did. I took off the 3 plastic covers by the door frame passengers side. I took the door panel off and looked at the speaker wires. You wont have to take the door panel out since I am giving you the picture. 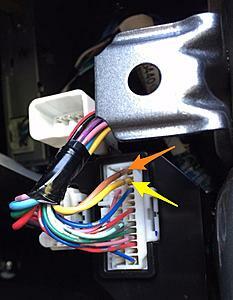 In the picture attached are the wires that come from the speaker to the head unit. Yellow and baige. Those wires hook into the plug in the picture and at the rear of the plug they change colors going to the head unit. They are red and green. The red is positive and the green negative. I spliced them and hooked my sub wires to them. From there I found a + power wire to power the sub and hooked up the ground to the bolt that holds the passenger seat to the chassis. I did everything so that the wires were hidden and not showing anywhere. I put everything back together and it is working great. By hooking it that way my powered sub turns itsel on when younturn thebradio on and dont have to have separate switches. It gets the signal from the speaker wires. By the way. Do notnunplug anything; i.e battery, plugs anything from the factory system or you will end up as I and some people have, with an airbag service message and then you will have to take it to the dealer to reset. Let me know if you cant see the picture. Have fun. Do notnunplug anything; i.e battery, plugs anything from the factory system or you will end up as I and some people have, with an airbag service message and then you will have to take it to the dealer to reset. this is ridiculous. i would rather take a trip to the dealer than risk damaging some electrical components, though. so if i want to clean my battery terminals, i'm getting an airbag warning light? WTF, Mitsubishi?????? Landshark. It is ridiculous. I agree. But it is a fact. disconnect the battery and it looses power so when you connect it again, you will get warning messages. Know by experience. Take it to the dealer if you dont want the hassle. But expect to drop your pants at the register. If not. Keep what you have.